It’s pretty much impossible to visit Zermatt, Switzerland without taking (many) photos of the Matterhorn. The gorgeous mountain towers over the entire village and is essentially an attraction itself, so it’s not surprising that it’s a popular subject for photos. But where should you go to get the best photos of the Matterhorn? We teamed up with a couple of other bloggers to come up with a totally instaworthy list! 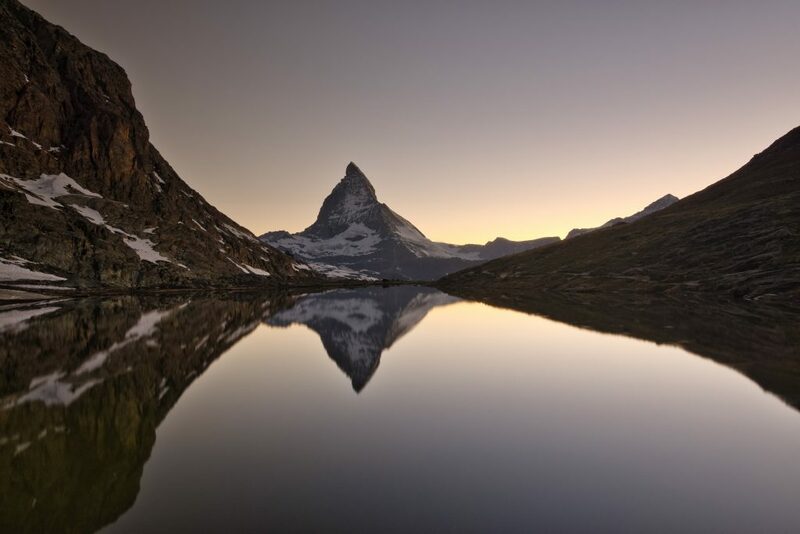 Grab your camera and head to one of these five spots for stunning photos of the Matterhorn. 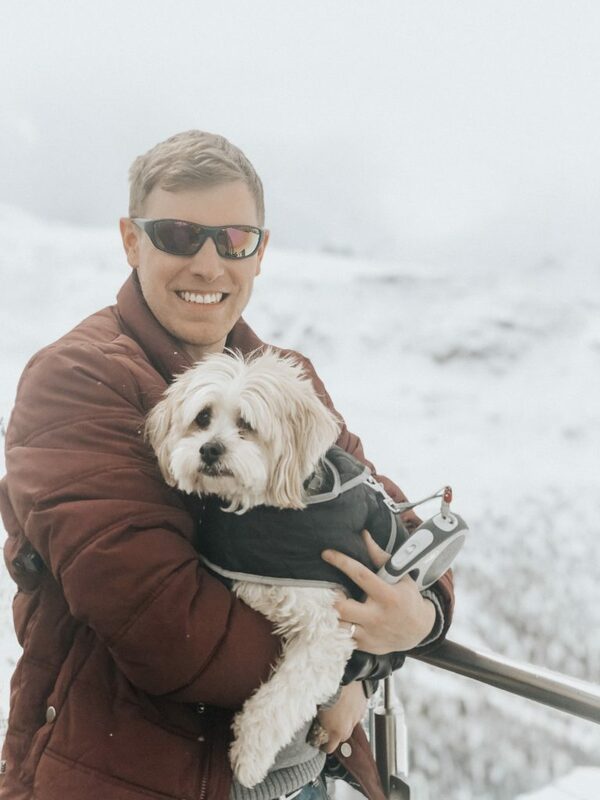 You never know – your photo might just end up on a Zermatt magnet one day! If you’re looking for an epic reflection photo, Riffelsee is the place to be. The stunning lake perfectly reflects the Matterhorn on calm days, and it’s a lovely walk to take in any case. To get to Riffelsee, hop off the Gornergrat Bahn at Rotenboden and follow path 21. It’s only a ten minute walk and you’ll be rewarded with an incredible view! 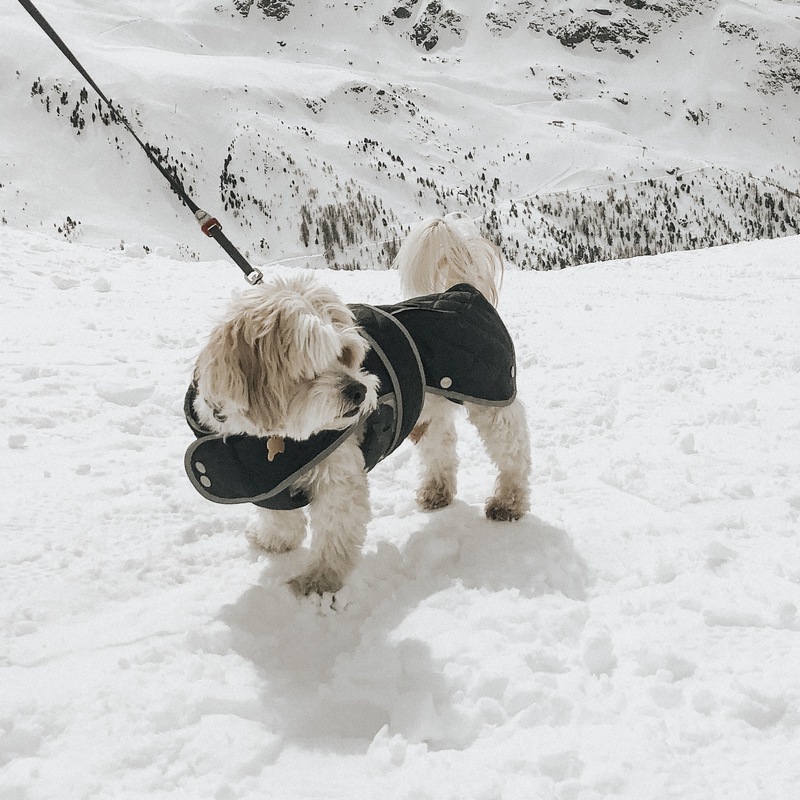 Walking can be done year round, but note that the path is not always cleared/visible in the winter, so it’s not advised to head that way if you are unfamiliar with the area. A similar reflection point is Stellisee. The lake is about a 20-minute walk from Blauherd, accessible by funicular up to Sunnega and then gondola up to Blauherd. 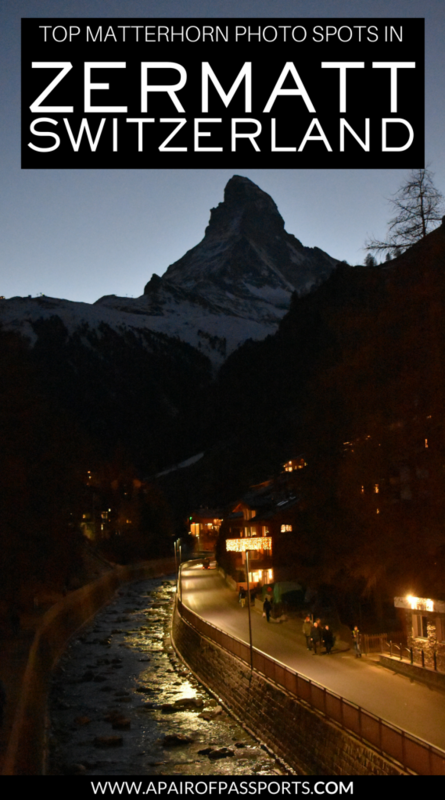 We especially recommend Micro Spikes while walking in Zermatt, no matter what time of year. You never know when you’ll come across an icy patch, and they’ll make your way through it so much easier. And sunscreen is essential – the sun is SO strong in Zermatt. Our favorite restaurant on the mountain is Chez Vrony, and the incredible view of the Matterhorn is part of the reason why! Sit down and enjoy a hot chocolate or a glass of wine while admiring the Matterhorn. 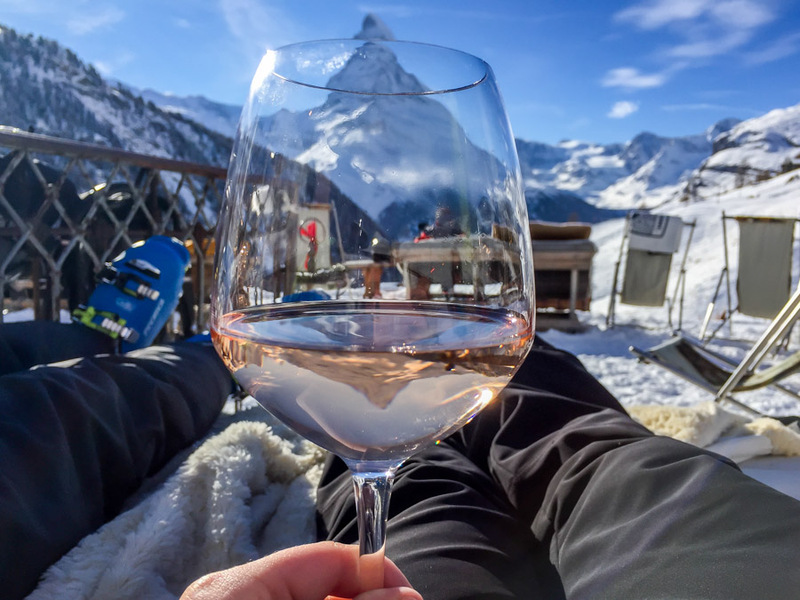 Fun fact: Chez Vrony is also a great place to get ‘reflection in wine glass’ photos of the Matterhorn – the rosè is to die for! The almighty Matterhorn is surely a beauty and taking a good picture of it is not difficult at all – after all, it is so high it cannot be missed and its shape makes it photogenic from wherever you take a pic. However, the easiest way to take a picture, and still have this awesome vie of the Matterhorn is to take it from the Vispa River. 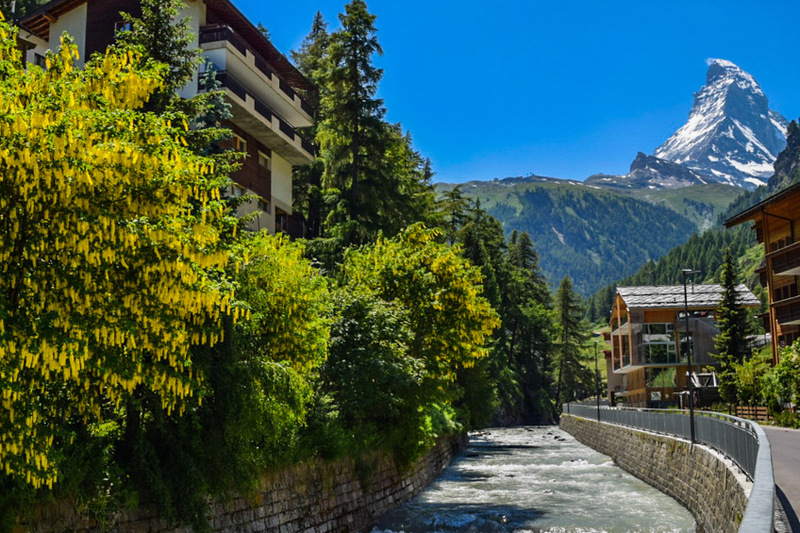 The river, which flows through Zermatt, cannot be missed so I recommend walking from the Zermatt town center towards the Matterhorn. While taking pictures can be exhausting you have many benches along the way so you can rest as well – always have the Matterhorn Mountain in front of you! Thank you Arzo, from Arzo Travels, for submitting this photo and information on your favorite spot for taking photos of the Matterhorn! 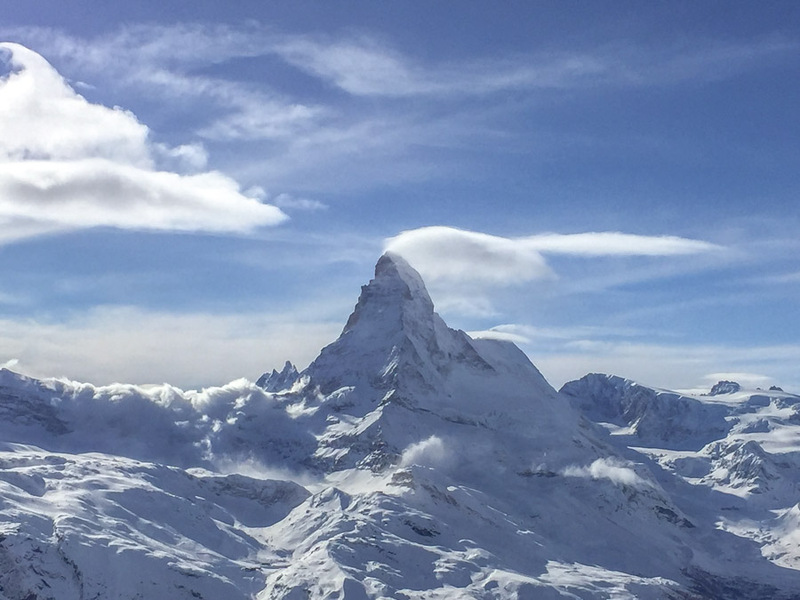 For a different angle of the Matterhorn, head up to Klein Matterhorn. The Klein Matterhorn (little Matterhorn) is at a blustery 12,739.5 feet above sea level, so be aware that you will feel short of breath once you reach the top. When arriving at the top, the doors opened and the cold thin air hits you, immediately chilling you to the bone. Make your way to the elevator, walking through tunnels that feel like you are entering an icy mine. Once you reach the top, you exit onto a stable metal platform where you are greeted with the imposing backside view of the Matterhorn. It is inspiring and soul-fulfilling to see this wonder of nature commanding the surrounding Swiss Alps. Viewing this impressive mountain nearly makes you want to bend the knee due to it’s dominating presence that fills your camera lens. It is not the iconic shot that you find most people shooting from the town below, but it is well worth the money to see and feel the magnificence of it so close to you on the peak of its little brother. Traveler Tip: Make sure to include a polarizing lens and UV filter in your bag as the reflection from the snow on the sunny days can be quite harsh. After you have filled your SD card with the 1,000 photos of the Matterhorn, head to Glacier Paradise. Glacier Paradise is just back down the elevator and further into the tunnels. This icy cavern castle is complete with intricate ice sculptures, a short icy slide, and comes with the ‘Glacier Paradise Throne’. It will be hard to leave this glorious wonder of nature. When you do leave, however, it is sure to leave an impression that you truly were a witness to the majesty that is the Matterhorn. Thank you Janiel, from CultureTrekking, for submitting this photo and information on your favorite spot for taking photos of the Matterhorn! We love taking our GoPro on the mountain with us if we are doing a combination of photography and skiing. If we are just walking, though, we take our usual kit – our MeFOTO tripod, wide angle lens, and polarizing filter. There are many spots on the slopes where you can get photos of the Matterhorn. However, of the three major peaks (Sunnega, Gornergrat, and Klein Matterhorn), Sunnega offers the most stunning views, especially on a sunny day! Whether you stick to the blues towards the bottom of Sunnega (near Chez Vrony!) and enjoy the incredible views there, or head all the way up to Rothorn, there are endless opportunities for photos of the Matterhorn while skiing down the runs. 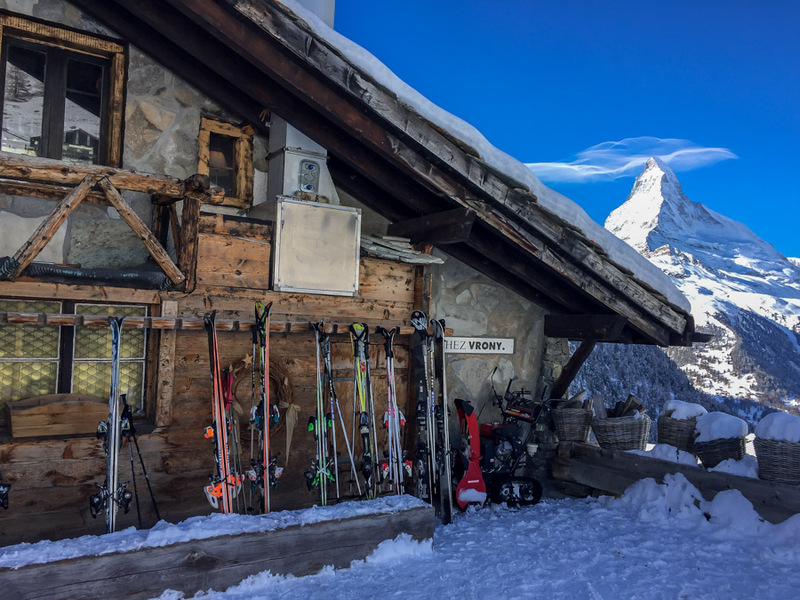 Plus – did you even ski in Zermatt without a photo of you skiing with the Matterhorn in the background!? If you’re looking for some Matterhorn photo inspiration, Nicole Hunziker takes some of the dreamiest photos we’ve ever seen! As she likes to say, they’re total #Matterporn! Make sure you share your Matterhorn photos with us! Beautiful photos! Love your site and all the tips of how to best capture this iconic mountain. Thanks! These photos and sites are breathtaking. Thank you for sharing. 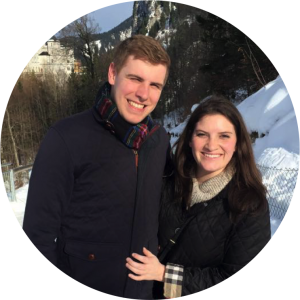 We haven’t done the Riffelsee walk ourselves, but hear that it isn’t a tough one at all! You take the Gornergrat train (the station is right across from the Zermatt station) up to Riffelberg and it’s about a 10 minute walk from there. In terms of restaurants, we love Cafe du Pont for fondue and Backerei Fuchs does a lovely cappuccino. 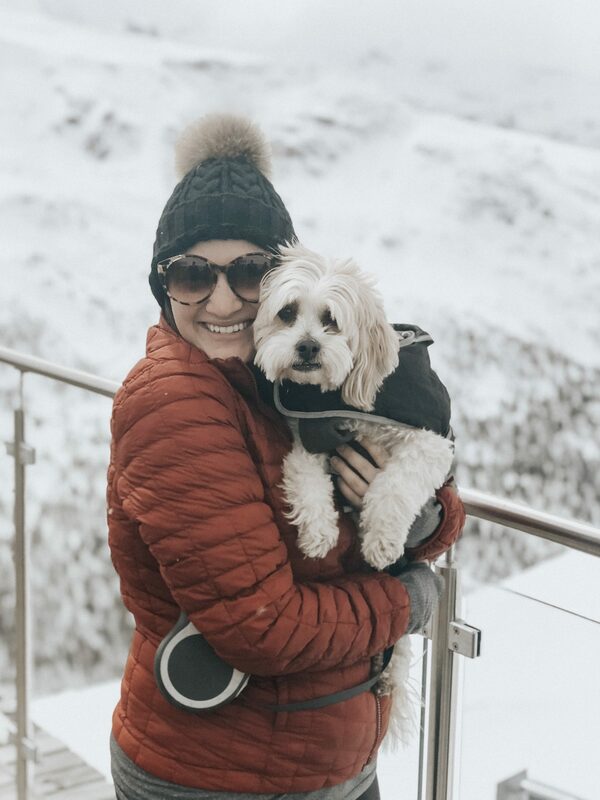 We absolutely love Harry’s Ski Bar and Cervo for drinks and Elsie’s is a nice spot for some champagne and oysters. 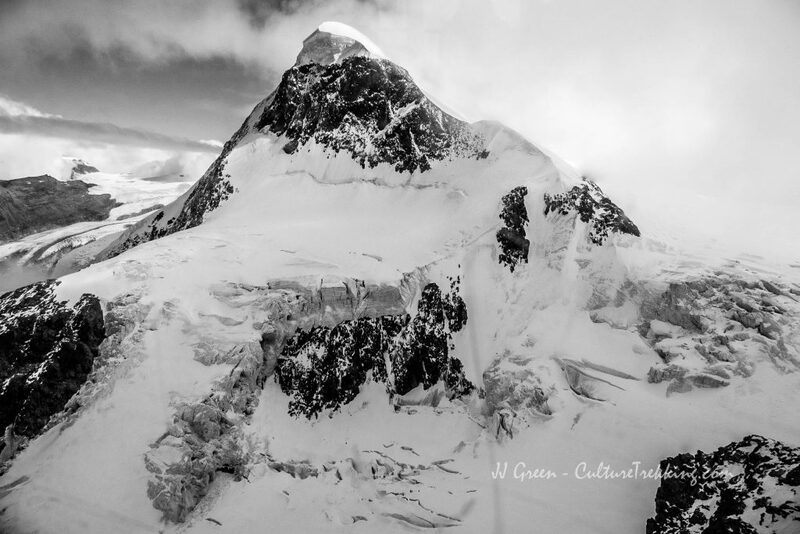 We have a ton of content on Zermatt coming soon (will be live before your trip!) so feel free to subscribe to our newsletter or follow along on social media so you’re notified when it’s posted. 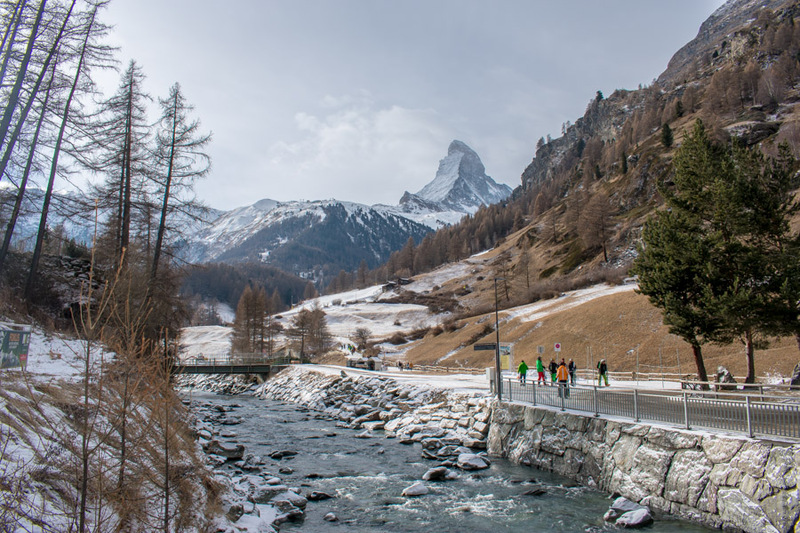 Let us know if you plan a trip to Zermatt – we have plenty of recommendations! Thank you! Unfortunately I can’t take credit for it, but I hope to one day get my own shot like that! As much as I hate winter, these shots are so beautiful I wish I were there right now! Wow, I am completely awestruck and also motivated by these pictures. 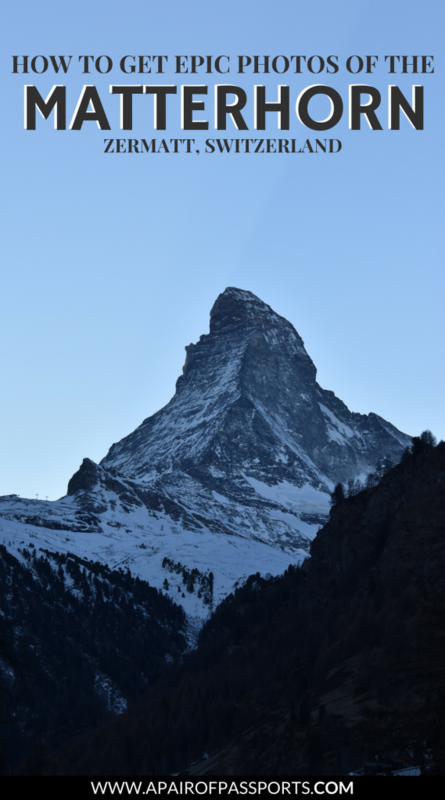 I have heard about Zermatt but not Matterhorn, so this was an insightful post. Hoping to see and capture these in my camera when I visit Swiss Alps. I hope you get the chance to see it – it’s a truly magical mountain! These are all such amazing, gorgeous pictures! Thank you for sharing. Your pictures are so lovely! I’ve seen the alps but have not yet been to Switzerland to see the Matterhorn. This makes me want to go! We highly recommend a trip to Zermatt! We’ll be posting a few more posts about budgeting, where to stay, etc. so keep your eye out! Such an icon and not a bad angle from any direction I can see! I am going to in Switzerland in April and I am trying to make my itinerary fit this in! Those are stunning photos. Great tips! I especially loved the one along the river. Stunning photos of somewhere I need to return to to see this mountain out of the clouds! !